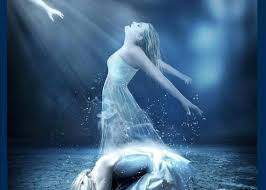 Geist und Seele wird verwirret (Spirit and soul become confused), BWV 35,[a] is a church cantata by Johann Sebastian Bach. He composed the solo cantata for alto voice in Leipzig for the twelfth Sunday after Trinity and first performed it on 8 September 1726. Bach composed the cantata in his fourth year as Thomaskantor in Leipzig for the twelfth Sunday after Trinity. It is regarded as part of his third annual cantata cycle. The prescribed readings for the Sunday were from the Second Epistle to the Corinthians, the ministry of the Spirit (2 Corinthians 3:4–11), and from the Gospel of Mark, the healing of a deaf mute man (Mark 7:31–37). The cantata text was written by Georg Christian Lehms and published in Gottgefälliges Kirchen-Opffer (1711). The text connects the healing of the deaf man to the thoughts of the believer who is left deaf and mute in awe looking at the healing of Jesus and God's creation. The text of the second aria is almost a quote of the gospel's last verse. Because of the requirements that "new music" be composed as often as possible, Bach seldom chose older poems for his cantatas; consequently, the conductor Craig Smith has suggested that parts of this work may have been composed earlier than the first recorded Leipzig performance. 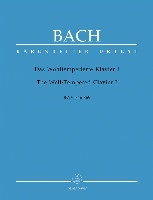 Bach had already composed his first solo cantata on a text by Lehms, Widerstehe doch der Sünde, BWV 54, composed during his tenure in Weimar, also for an alto soloist. 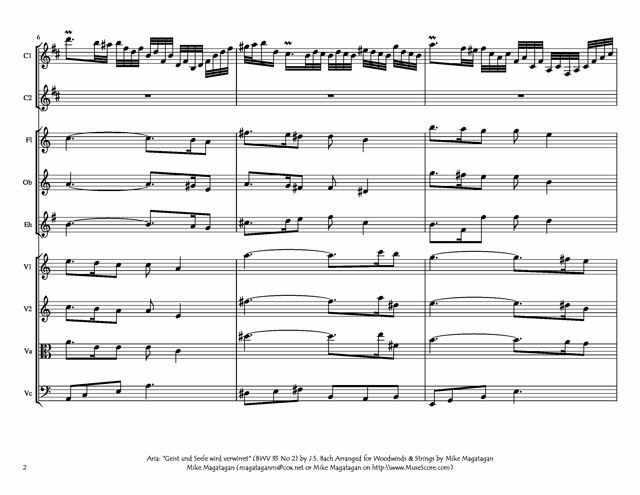 The cantata is one of three Bach cantatas written in Leipzig in 1726 in which an alto is the only vocal soloist, the others being Vergnügte Ruh, beliebte Seelenlust, BWV 170, and Gott soll allein mein Herze haben, BWV 169. It seems likely that Bach had a capable alto singer at his disposal during this period. 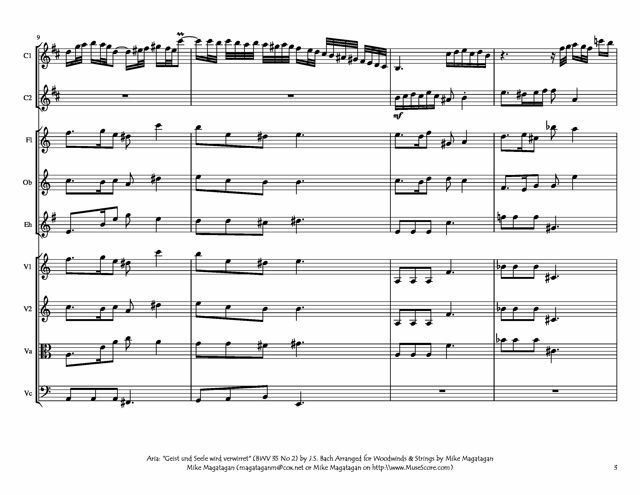 Bach had earlier composed two other cantatas for the twelfth Sunday after Trinity, in his first year in Leipzig Lobe den Herrn, meine Seele, BWV 69a, first performed on 15 August 1723, and in his third year Lobe den Herren, den mächtigen König der Ehren, BWV 137, first performed on 19 August 1725, as an added part of his cycle of chorale cantatas. Both works focus on praise (Lob) and use an orchestra including festive trumpets. Furthermore, the work has two large concerto movements for organ and orchestra, probably from a lost concerto for keyboard, oboe or violin, perhaps indicating that the cantata was composed for a seasonal choral absentia at Thomaskirche. The first nine bars of the opening sinfonia are practically identical to the fragment BWV 1059. Bach led the first performance on 8 September 1726, and probably played the organ part himself. He structured the cantata in two parts, four movements to be performed before the sermon, three after the sermon. Both parts begin with a sinfonia. Bach scored it for an alto soloist, two oboes (Ob), taille (Ot), obbligato solo organ (Org), two violins (Vl), viola (Va), and basso continuo (Bc). 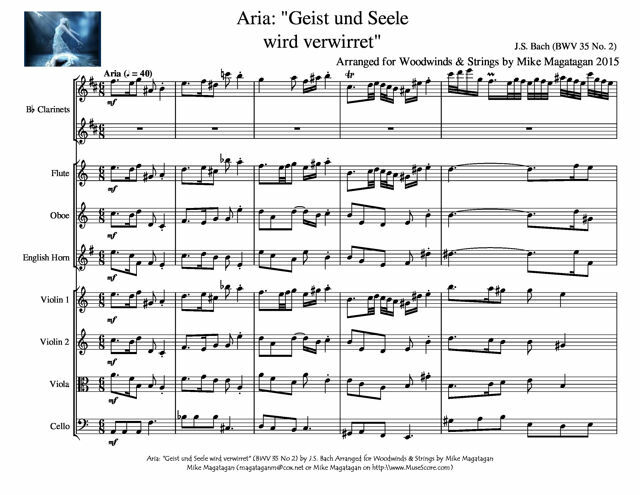 I created this arrangement of the first Aria: "Geist und Seele wird verwirret" (Spirit and soul become confused) for Woodwinds (2 Bb Clarinets, Flute, Oboe & English Horn) and Strings (2 Violins, Viola & Cello).